For two decades, Ashdene has been designing and manufacturing beautiful homewares products for their adoring clientele. Ranging from cushions to bone china tea sets, mugs, trays, placemats, and more, you can be assured that their products will always be embellished in gorgeous and unique designs. As a proudly Australian company, Ashdene is often inspired by the majesty of our Australian landscape, and our own very unique sights and attractions. Now, Ashdene has captured the magic of our great southern land in their Down Under range. This Australia-themed cotton Tea Towel features colourful images of our country’s most well-known flora and fauna, including our national coat of arms, Tasmanian blue gum, Sturt’s desert pea, kangaroo paw, and more. 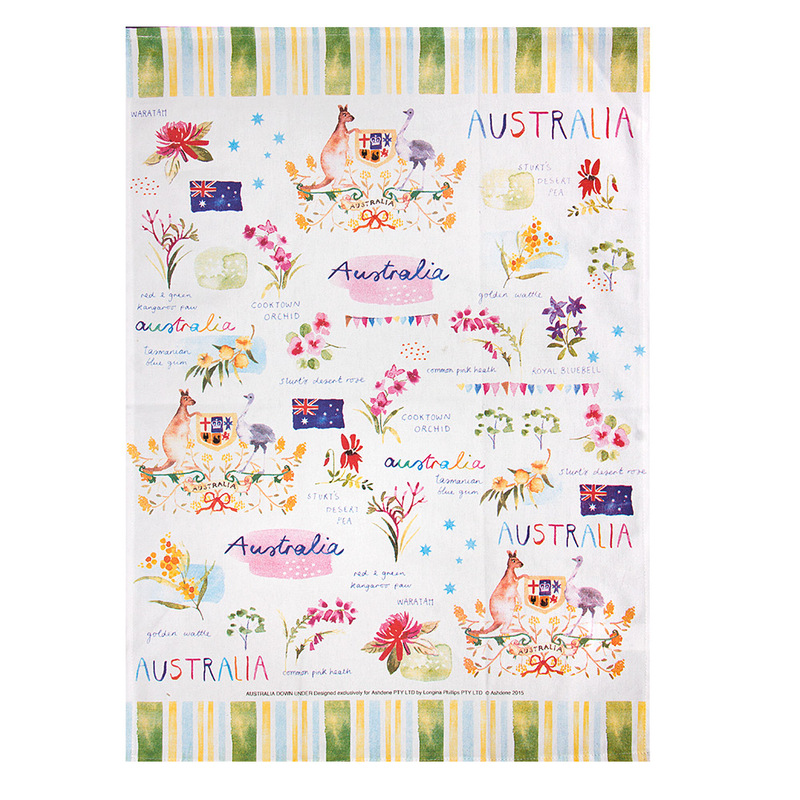 With Ashdene Australia Down Under Tea Towels, you’ll be colourfully reminded of why our country is so amazing, every time you dry the dishes… a quirky way to show off your patriotism for sure! Features vibrant and colourful Australian fauna and flora-themed illustrations including our national coat of arms, Sturt’s desert rose, the waratah, common pink heath, kangaroo paw, and more. Dimensions: 70cm (l) x 50cm (w).